I was in celebration mode on August 25, 2016, the day a personal essay had been published in a national newspaper for the first time. I waltzed into a nail salon for a manicure and pedicure. For many women, this would be routine. For me, it was a rare event, and the first time I’d had both treatments simultaneously. Gel seemed to be the better deal on a cost-per-day basis. I decided to splurge on my fingernails, as they take a bigger beating than my toenails. So, I thought to myself, gel nails are at least fifteen dollars more in total. Oh well, they would still be a better value. I enjoyed beautiful nails for several weeks, got compliments, and felt more feminine – more put-together. I understood why so many women make professional nail care a priority. I decided to shelve my usual practicality and get with the program. “Grape juice,” he said with a twinkle. I didn’t want to know. I was hooked. On December 23, I chose a beautiful festive red. Within a day, I tore off some of the nail and more of the polish on my left index finger while loading a heavy item into my trunk. I repaired the damage as best I could, using pink polish I had on hand. Days later, a chip of colour came off my right thumbnail as result of flossing my teeth. And so it went. 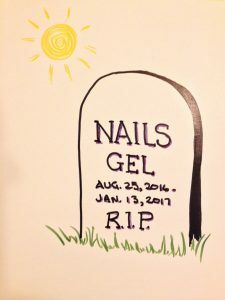 After several applications – and removals – of gel polish, my nails had become weakened and less functional. Rather pitiful-looking, also. It has been a fun run, but I’m done. I’m humbled. My nails now sport a clear polish designed to strengthen damaged nails. I’ll find other ways to feel feminine and put-together. This entry was posted in Writing on January 20, 2017 by Wilda. Thanks for letting me know I have not been the only one to experience this. I’m glad I blew the whistle.